2 – Take a Bite out of the Big Apple in New York- order a pretzel and climb the Statue of Liberty. Walk though Wall Street, Broadway and Central Park and get neckache by staring up at the Empire State and Chrysler Buildings. 3 – Unleash your Inner Gladiator in Rome. Visit the Colosseum, the Pantheon, the Spanish Steps and the Trevi Fountain. Recharge with ice cream before heading to St Peter’s in the Vatican City. 4 – Fall in Love in Venice – drift along in a gondola, gaze at the Bridge of Sighs, eat black spaghetti and wander through St Mark’s Square. 5 – Do the Tourist Thing in London – Big Ben, the Houses of Parliament, a West End Show and Trafalgar Square. The Tower of London, Buckingham Palace and Piccadilly Circus…no wonder more than 27 million people visit each year. 6 – Trek in the Peak District – between rugged hills and homely pubs, Yorkshire puddings and the Dambusters Museum. 7 – Hike through the Brecon Beacons – take a map, proper shoes and stomp through this SAS training ground. 8 – Wander lonely as a cloud in the Lake District – remember to take wellies and a poetry book. 9 – Catch a sea breeze while climbing the rolling hills of the South Downs. 10 – Ramble through the Cotswolds – with roaring fires and home-made fudge waiting for you when you get in. 11 – Enjoy the spice in Marrakesh – drink fresh orange juice, barter in souks and dine surrounded by mosaics and fountains. 13 – Cross from Europe to Asia within the same city in Istanbul. Enjoy the Blue Mosque, the Grand Bazaar and a cruise across the Bosphorus. 14 – Athens –weave through the smog and climb high to see the Acropolis. 15 – Budapest – bathe in thermal spas then wrap up warm for Buda castle and beef goulash. 16 – At Stonehenge – admire the ring of stones that have kept their mystery for over 5000 years. 17 – The Lascaux Cave Paintings – head underground to face woolly mammoths in the Dordogne, France. 18 – See the Rosetta Stone and other ancient Egyptian artifacts in the British Museum in London. 21 – Step back 225 million years with the petrified remains in the Natural History Museum, London. 22 – In Harrods, Knightsbridge, London. Well, it doesn’t cost anything to browse. 23 – Mingle with the Yachts in St Tropez – it’s free to walk along the harbour in this atmospheric, small French town. 24 – Gamble in Monte Carlo’s casino – there is a public section – then follow the Grand Prix course through this twisting coastal city-state. 27 – Even in fancy dress at the notorious School Disco in London. 29 – In Britain’s only natural thermal spa in, er, Bath spa. 31 – Within the vast grounds of Blenheim Palace, Winston Churchill’s birthplace in Oxfordshire. 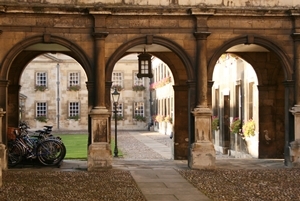 34 – In Cambridge– home to Isaac Newton, Charles Darwin and Hugh Laurie. Enjoy the punts, the pints and 800 years of history. 35 – In Oxford – whose dreaming spires overlooked Margaret Thatcher, Tony Blair, Rupert Murdoch and Esther Rantzen. 37 – The sandstone streets and sunshine of Salamanca in central Spain. 38 – The University of Paris – the Sorbonne – the former stomping ground of Marie Curie and Victor Hugo. Then treat your stomach to.. Grab some late summer sun with a weekend.. So, there you go. 101 cheap weekend breaks. Enjoy exploring the world one weekend at a time. How about the three peaks challenge? Great post, but it depends on where you are coming from. I’m in the UK so a trip to New York for the weekend is a touch too far.